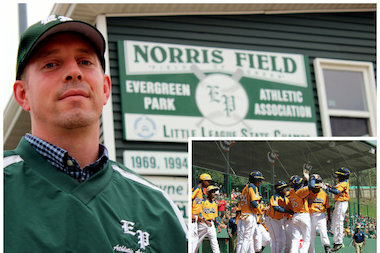 Evergreen Park Little League vice president Chris Janes noticed news reports during and after the World Series that quoted suburban officials celebrating various players as hometown heroes, which raised questions about whether the Morgan Park-based Jackie Robinson West abided by Little League residency rules. The Evergreen Park man who blew the whistle on Jackie Robinson West has been called a racist, received death threats and been told by his boss not to come to work because of safety concerns in the 24 hours since Little League International stripped the South Side team’s U.S. title. Chicago police have instructed beat officers to keep close watch on Chris Janes’ place of employment at the request of the company’s regional manager, a police source told DNAinfo Chicago. Janes, the Evergreen Park Athletic Association vice president, was the first to ask Little League International to look into allegations that JRW cheated by improperly stacking its roster with players outside its district. On Tuesday night, Janes filed a report with Evergreen Park police about the threatening phone messages he received on his home line, such as “I hope you die,” “rot in hell” and “f--- off,” among other things. Janes said the angry social media attacks and other messages picked up steam after the Rev. Jesse Jackson and the Rev. Michael Pfleger of St. Sabina Church publicly accused him of having racial motivations for pushing Little League to investigate Jackie Robinson West. “They have the ability to rally people, and that can be for good or bad. On the radio today, Rev. Jackson called me a racist. … Coupled with the fact that people are posting my phone number and address online, what is the intent? What good can come from that?” said Janes, who is married to an African-American woman with whom he has four children. “If they think there are racial undertones that’s fine, but why identify a person and drag them into it? I don’t get it,” he said. “There’s always a suspicion that the guy from Evergreen Park challenges the integrity of parents, the worthiness of the children. That’s over the edge,” Jackson replied. Jackson said he has never called out Janes by his name. Venisa Green and her son Brandon were joined by the Rev. Jesse Jackson and the Rev. Michael Pfleger at Operation PUSH. Pfleger has taken aim at Janes, as well, in public and on his Facebook page. “I am both angry and disgusted at the obsession of this man from Evergreen Park to try and take away the championship … Is the fact that an African-American Team could do so well, Unite the City, and prove the Great Children that this is the Norm on the South Side, is that so Distasteful to you Sir, that you have worked day and night to discredit these young children. GET A LIFE … and leave our Children alone,” Pfleger posted on Facebook. On Thursday, Pfleger stood by his opinion that the investigation into Jackie Robinson West cheating allegations and the decision to strip the title was racially motivated. "I did not say I believe he is racist. I can’t not believe that race was not in the mix. I have a right to my opinion,” he said. Janes said his complaint has nothing to do with the final decision Little League International made to strip Jackie Robinson West of the U.S. title on Tuesday. “If they think I’m a racist, that’s got nothing to do with the decision Little League made. Little League makes that decision, not me. All Evergreen Park Little League did was point out the wrongdoing here. That’s all we did, and Little League squashed it twice,” he said. “At the end of the day … it wasn’t until Jackie Robinson West’s sister leagues who are comprised of largely black folks stood up and complained as well. Patrick Wilson, who runs the Little League World Series, is African-American. He was in on the decision. This has nothing to do with race,” Janes said. 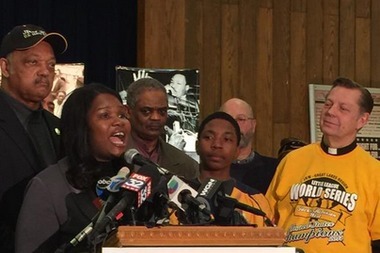 At a Thursday news conference, an attorney representing Jackie Robinson West told reporters that league officials he represents do not condone harassing Janes or Janes' family. "We have heard reports that there is a coach in Evergreen Park who has been threatened, people are camping out at his home, and people are treating him in an improper way, death threats and things of that nature. The gentleman in Evergreen Park should not be attacked," attorney Victor Henderson said. "The boys on the team, the parents and the family [of Jackie Robinson West officials Anne and Bill Haley] have made it clear that they want no part of that and they do not support that,” Henderson said. Janes said Evergreen Park police have kept close watch on his house, and his family is hanging in there. The Rev. 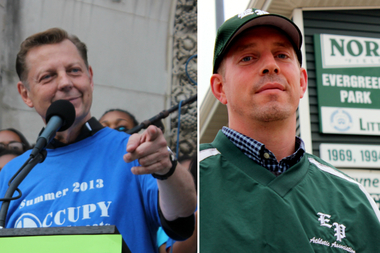 Michael Pfleger, left, and Chris Janes of the Evergreen Park Athletic Association.